5 - 40 cm broad. Convex to broadly convex, expanding to nearly plane wiyth age. Bright yellowish orange, becoming rusty orange to tawny gold to orangish brown or reddish brown at maturity. Surface dry, covered with fibrils or small fibrillose scales. Margin incurved at first, and when young can be decorated with remnants of the veil, straightening or becoming wavy in age. Flesh yellowish. Sometimes bruising blue/green in young specimens. Attachment adnate to sinuate to subdecurrent. Pale yellow to rusty orange, becoming rusty brown with spore maturity. Close to crowded. 30 - 250 mm long by 1 - 10 mm thick. Firm, solid, unequal, swelling in the middle or often narrowing towards the base. Surface covered with fine fibrils below the ring. Partial veil densely cortinate to membranous, usually leaving a well-formed, membranous annulus in the superior regions of the stem, soon dusted rusty orange from spores. Spores rusty orange in deposit, ovoid to ellipsoid, roughened, 7 - 10.5 by 4.6 - 6 microns. Basidia 2- and 4-spored. Pleurocystidia absent. Cheilocystidia fusoid-ventricose with subcapitate apices, 18 - 24 by 4 - 7 microns. Late july through november, although there have been reports that it can fruit in all times of the year given the right conditions. Look in in the woods on both dead conifers and hardwoods, Usually found in older growth patches of woods of the Pacific Northwest and also on the East Coast of North America. Always growing saprotrophically, in clusters and groups. 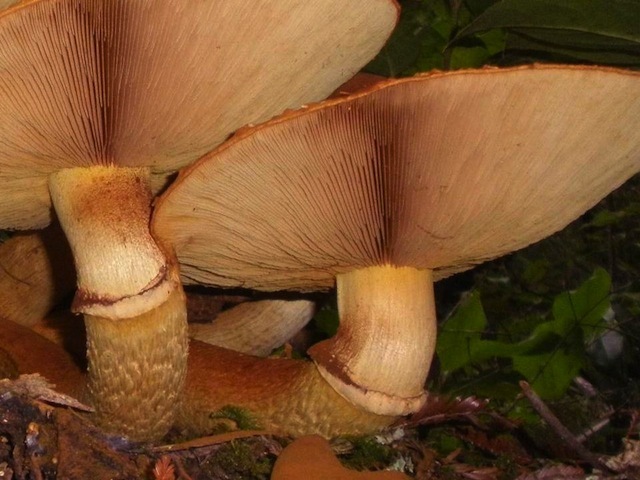 Bruising will not be obvious in this species as it is not as potent as other active Gymnopilus species. There may be green or blue bruising on the cap as well as the stem and base, but not always. Even though many mushroom enthusiasts state that this mushroom is inactive on the west coast of the USA, "I found a patch that were highly hallucinogenic in the west coast (Joust), this confusion is usually becuase of a misidentifacation between G. ventricosus and G. junonius/spectabilis in which the former does not contain the hallucinogenic compounds psilocybin, psilocin, beaocystin, and norbeaocystin. Studies need to be done to determine that there aren't actually two groups of junonius; ones that are active and ones that are not. Some speculate that there is two separate species, G. junonius and G. spectabilis.